Starting today, we began shipping replacement gripper strips to Prop 'n Go users. The packages contain two strips per Prop 'n Go and installation instructions. To speed up the process, we are shipping the new strips as each production batch is ready, in order of purchase date. Thanks for your extended patience. The fix is on the way. Hello again. We have great news. After extensive testing of many different types of adhesives, we've found a much stronger tape. They withstood a week of extreme temperature flucuations in an enviromental chamber, which effectively speeds up the aging process. Now that we have gripper strips that will last years, we are ready to mass manufacture and ship out the replacements. Our goal is mail out the replacement strips by Friday 8/26. Take a look at the pictures below to see the testing results. A quick update on the replacement gripper strips. 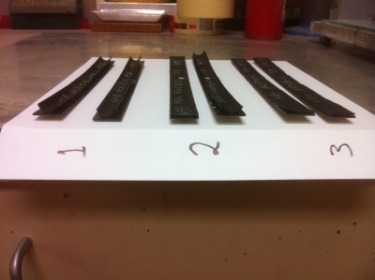 Our partners have prototyped various samples to compare adhesive strength and longevity. These prototypes are now resting in a refrigerator, hot box, and a humid room. In a few days we will again inspect the strips to see if there are any signs of failure. Once we are sure they're ready, we will begin shipping out replacements immediately. Thanks for hanging tight with us. The fix is on the way. Nearly a month ago we discovered an issue with the gripper strips on Prop 'n Go. We quickly diagnosed the problem—weak tape, and found the apparent solution—stronger tape. All seemed to be better until a few days ago when we discovered a new problem. It appears this time the rubber "attacks" the tape, making it softer and weaker, eventually causing the strips to peel up. Instead of problem solving on our own, we're working with the component manufactures to find the best permanent solution. This weekend we will test a range of alternatives and choose the strongest replacement by Monday (8/8). Then we will mass manufacture the new strips and immediately mail them out to all customers. If you've previously ordered a Prop 'n Go, you will receive an email upon shipment of your replacement strips. Between now and then, continue using Prop 'n Go normally and if the strips begin to peel, simply push the strips down temporarily. We're deeply embarrassed and sorry for this problem. It's more than that though. Our goal is to make the best possible products that make your life even better, and we've come up short recently. Needless to say, we've recently learned a lot about how to make truly great products (hint: obsessive product testing). Unsurprisingly we've also been reminded about how patient and awesome our customers are. Thanks for hanging in there with us while we figure this out. We have good news! The gripper strips that keep devices in-place and secure on Prop 'n Go have been upgraded. They're even stickier and more long lasting. These upgraded strips come installed on all new Prop 'n Go orders. But that's not all, we've decided to upgrade all Prop 'n Go's with better strips. Starting yesterday we began mailing out upgraded strips. If you previously ordered a Prop 'n Go, you'll receive the strips soon. For instructions on how-to install, check out our special install page with a follow-along video demo. We hope you enjoy the upgraded strips and keep on propping! Starting today we're offering Prop 'n Go lite (Microsuede) on Amazon.com. It's reviews are lonely. Be the first to write a positive note! Thanks. Merci. Mahalo. And more. First Prop 'n Go was reviewed by Mel Martin at The Unofficial Apple Weblog (TUAW). Mel liked Prop 'n Go so much he calls it, "the premier case/stand to use with an iPad around the house" and "a well thought-out product that is going to make a lot of people happy who have been frustrated by other solutions". Thanks Mel and TUAW. Next it was featured around the globe at VIPad.fr by Jcsatanas. Our favorite (albeit translated) quote is, "Padded Spaces thought of you by creating the Prop 'n Go". Merci VIPad. Lastly, Prop 'n Go is now in-stock at Amazon.com. For a fantastic buying experience and discounted shipping, check out Amazon. And one more thing, we've updated our shipping settings to allow worldwide ordering and even cheaper priority shipping. Happy Apple WWDC next week. Have you seen the new Apple iPad 2? Who could have thought the iPad could be even better so soon? Because of Prop It Up's future-proof design, the iPad 2 fits perfectly. No need to buy a new case or stand like the other guys. Even better, the Prop It Up works great with most cases and device wraps. Including the new Apple iPad Smart Cover, which doubles the amount of angles available from 10 to 20! That's a lot of angles. And now when you video chat with the iPad 2, you won't have to hold it the entire conversation. Simply rest it on Prop It Up and stay handsfree. See you in line on March 11th! Seasons greetings from your friends at Padded Spaces. 1) Prop It Up is back in-stock at Amazon.com with Free Super Saver Shipping. Due to overwhelming customer demand, keeping Prop It Up available on Amazon.com has been challenging. If it sells out again, please consider giving Prop It Up as a Gift Card or buy direct from us at the Padded Store. 2) Starting today were offering limited quantities of discounted Prop It Up's. You can save $10 by purchasing a refurbished/discontinued Prop It Up (sold as-is with no returns accepted). Order while they last. Remember to order on or before December 20th to ensure delivery before Christmas. Happy Propping. Despite the increase in orders, we are still shipping every new Prop It Up typically the same day they are purchased! Until next time, keep on Propping. That was a crazy month. Thanks to a humbling shout out on Macworld.com by THE Christopher Breen, we have been fantastically busy. We would like to share a few exciting updates and plans for the future. In summary, it's going to be a great 2nd half of the year! We are shipping an insane amount of these unique lap desks. From 5-year-olds to grandparents, from across the Atlantic or just across the street, our customers are truly enjoying Prop It Up. When we got a spare second, we spent some time in the lab working on Prop It Up. We made careful adjustments to make it lighter and work with even more types of devices. The updated design will be available for ordering in the next 7-10 days. Shipping will not be interrupted during the transition. There is one more thing... About two months ago we began working on a project codenamed "Go". I'm not allowed to give away too many details about the product, but I can share a few! We are among the 3 million people who are already loving the Apple iPad. It has truly changed the way people use and understand their computers. After tackling the biggest issue with tablets (the oftentimes awkward holding and usage of the device), we want to try our hand at solving the issue of traveling with a tablet. Whether you're riding a bike, flying-off for a vacation, or just walking to a friend's house, we will be delivering the perfect all-in-one solution for you and your tablet. That's all I'm allowed to share about "Project Go" for now, except this one last nugget... Ramping up from 100s of orders to 1000s to 10,000s is a daunting challenge. It also takes time. To meet customer demand, we plan on offering a small limited run of the new product, before our first big batch is completed. Our hope is to have it available to the lucky few by the middle of August. Follow us on this blog, Twitter, and Facebook for additional news and updates. It's been a little more than a month since we released Prop It Up to the world. Since then we have been insanely busy building and delivering Prop It Ups across the country. In the last two weeks we have been able to increase our output and fullfil orders typically within 1 business day, despite the fact that sales have been beyond our projections! Well our designers have been in the lab and have two new products that we are dying to introduce. We are probably 1-2 weeks away from an announcement, but needless to say, it's big! Stay tuned. You can follow us on Twitter @PaddedSpaces to get all of our updates and news. We are happy to share another fantastic review of Prop It Up. Thanks to Tad for taking the time to try out and write about our product. "The padded cushion that rests on your lap is very comfortable, and there's a nice leather carrying strap at the top." "Set the stand in the first or second divider and you've got the perfect platform for watching movies..."
"If you plan on doing a lot of typing on your iPad in your living room, then you can't go wrong with the prop it up!" This morning Padded Spaces began accepting orders for the Prop It Up on Amazon.com. It is wonderful to be available at one of the largest stores in the world and meet tons of new customers. We expect many customers to add a Prop It Up to their shopping carts when purchasing a new Kindle. Check it out at Amazon.com. This just in, we have been reviewed! The Unofficial Apple Weblog (TUAW) are the first to review Prop It Up. "You put your iPad on the plush, wedge shaped base, and you can adjust the angle from very low to about 80 degrees. The iPad stays in place, and I enjoyed using it." "Of all the things I tried, this was the nicest iPad stand for around the house..."
My name is Ben and I am a co-founder of Padded Spaces. My partner (and mother) co-founder's name is Cathy. We have one employee as of today, Heather. We are so excited to have a product -Prop It Up- that our customers love! Two months ago we began rapid-prototyping lots of different types of lap desks, made specifically for the iPad. Over those weeks, we changed, altered, tweaked, and put the finishing touches to make the product you see today. Two weeks ago we turned on the lights to our website, PaddedSpaces.com and began taking orders and sending out PR statements. Last week we began delivering orders and sent out our first batch of review units. iBedside, Prop 'n Go are registered USA trademarks & patents.